OU Degree 1st Sem Practical Exam dates time table 2016 semester schedule : Osmania University OU UG 1st Semester Practical Exams 2016 Schedule issued. B.A/ B.Com/ B.Sc/ B.B.A / B.S.W I year Practical Examinations time table released. 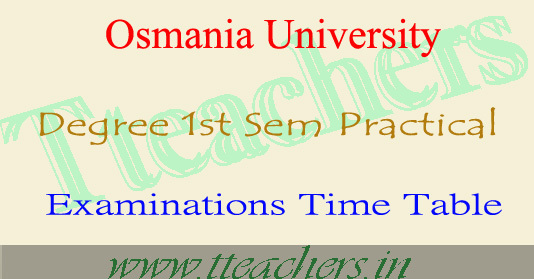 Osmania University Degree 1st sem practicals schedule is available on www.osmania.ac.in. OU Degree 1st sem practicals will be conducted during 24-11-2016 To 30.11.2016. 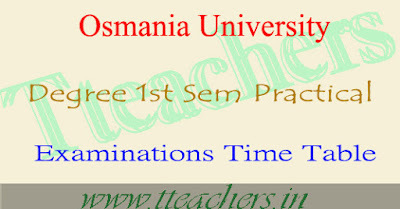 Students may check the 1st sem practical exam dates and exam centers as listed below.OU Degree 1st Year 1st Sem Practical Exam Dates – Nov 2016 of Degree B.A/B.Com/B.Sc/BBA 1st Year 1st Semester has been published by the Osmania University authority at the official website www.osmania.ac.in. Candidates who are pursuing the degree 1st year in osmania university & its affiliated colleges check 1st semester practical examination time table 2016 from the official website of the osmania university or from the table mentioned below…. From this academic year 2016-2017 the Telangana Govt has decided to conduct the degree exams according to semester wise.So the degree exam conducting authority of the osmania university has scheduled to conduct the 1st semester practical examination for the 1st year students of OU. 2. to conduct the Practical Examination on the basis of Nominal Rolls submitted by the Principal or on the basis of Hall Ticket of the candidate. 3. to send the Answer Scripts, immediately, but not later than 06-12-2016 along with the ‘D’ forms and the award list in duplicate in the same bundle.